Exactly as described. BEAUTIFUL. Great Quality too. Simple and elegant the Fuji DLX is ultra-comfortable. Thick lines create a simplistic curved frame and a low backrest supports a plush upholstered seat. 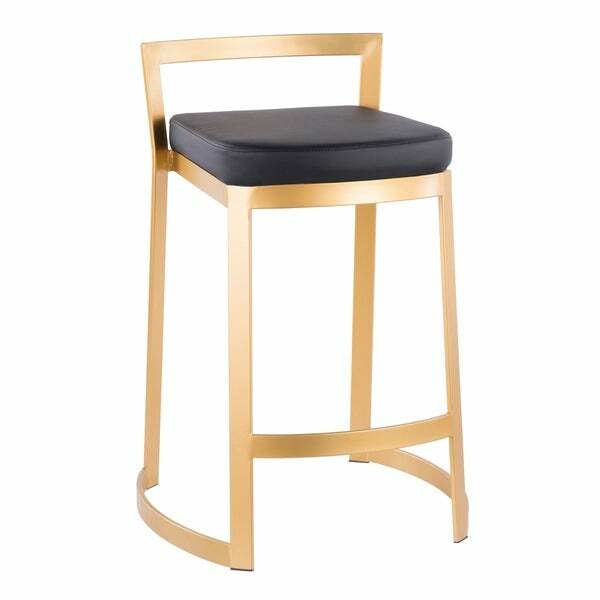 A stackable design for easy storage makes this a great stool for entertaining. With its simple glam style, the Fuji DLX is sure to match your modern decor. Available in a variety of colors, choose the look that best fits your dining space. Dimensions 21.25 In. X 22.75 In. X 33.0 In. I bought 6 white with gold chairs for my island. They are super comfy, super sturdy and have a bottom pad for the chair corner. They look super awesome with the gold fixtures brown cabinets and white porcelain countertop with gold veining. The only comment is that I wish it came with a little bottle of touch up paint. I fixed that by getting some matching touchup paint. I purchased these chairs for my large island and couldn’t wait for them to arrive. I am very impressed with the look of the chair, however trying to assembe them was a terrible experience. Out of 4 chairs, only one of the seat cushions, had properly drilled screw holes that would accommodate the screws sent with the chair. I have 2 chairs with 2 out of 3 screws properly attached, 1 chair with 1 out of 3 screws attached, and 1 chair with all screws properly attached. The screws won’t screw into the hole. The hole is just a useless hole. It seems the manufacturer paid very little attention to these important details and now I need to go through the pain of sending at least some of the chairs back. "How my do each of these chairs weigh?"